See our newest development in the Maple Hill Subdivision, located in the northwest suburb of Kildeer. See some of our new construction in Arlington Heights, where homeowners enjoy their custom homes in established neighborhoods - close to schools, restaurants, trains and expressways. See our newest development, Evergreen Point, located in the northwest suburb of Kildeer. Visit Prairie Trails, set on rolling land in historic Long Grove, characterized by open acreage and a charming village. Explore our recent project, Barrington Court. Situated near the heart of Barrington, minutes from the train and within walking distance to schools, this development provides the best of custom and semi-custom houses with location in a suburban town setting. Visit Tall Oaks of Kildeer, a site of incomparable beauty with gently rolling acreage of lush prairies, grasslands, and, of course, lovely tall oak forests. Situated off Cuba Road near Long Grove, the location provides easy access to nearby highways while still allowing a retreat to the country. 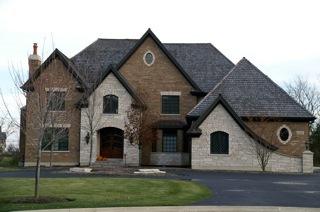 Castle Rock Construction has been one of the largest providers of custom homes in The Ponds of Kildeer. This development, near Quentin and Cuba Roads in Kildeer, shows many of our finest award winning homes. See The Groves of Palatine, a multi-family development in the heart of Palatine near the train and within steps to shopping and restaurants. Castle Rock Construction has completed over 75 custom and semi-custom houses, plus additional units in multi-family developments in Palatine and Ivanhoe. We have houses in "The Fields of Long Grove", "The Ponds of Kildeer", "Ivanhoe", "Tall Oaks of Kildeer", "Barrington Court", "Prairie Trails", and in scattered sites in the North Shore and Northwest Suburban areas ranging from Lake Forest to Barrington Hills.